Hidden Valley Wine Farm, located on the slopes of the Helderberg Mountain near Stellenbosch in Cape Town, innovatively deviates from timber frame construction convention due to the unique requirements of the build, which rests instead on custom-made light-steel bases supported by concrete columns. Hidden Valley Wine Farm, located on the slopes of the Helderberg Mountain near Stellenbosch in Cape Town, has a gentle approach to their craft, leaving much up to the dance between soil and climate to dictate the outcome of their highly acclaimed wine and olive produce. It made sense, then, that their brief for luxury cabin accommodation on site called for timber frame construction, not only for natural aesthetic appeal, but for environmental considerations as well. Nestled in a valley rich in indigenous flora and fauna, Hidden Valley Wine Farm’s architecture pays careful homage to its surrounds. With much the same approach to commissioning the guest accommodation on the farm, Rustic Homes, leaders in timber frame construction, were briefed to build two luxury wooden cabins, including a deck and pool area seamlessly connecting the two, above the farm’s olive groves. The site chosen for construction of the main lodge and two-bedroom cottage was along an overgrown and unused farm road, which was the only level piece of available land on the steeply sloping estate. Much as the old road dictated the path its users took in years gone by, it came to set the stage for the configuration of the two cabins. The foundations of the project innovatively deviate from timber frame construction convention due to the unique requirements of the build, which rests instead on custom-made light-steel bases supported by concrete columns. Timber frame construction was an ideal solution to the challenges posed by the sloping, hard-to-reach site. Thanks to its lightweight properties and ease of prefabrication off site, the structural components could be transported to site and erected with minimal impact on the surroundings and a relatively brief turnaround time as compared with traditional building methods. 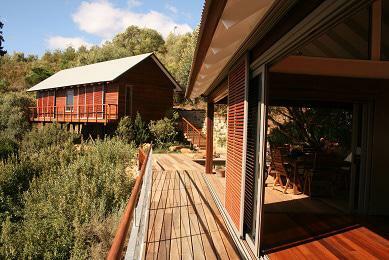 The exterior of the cabins is cladded in hard-wearing and weather-resistant Eucalyptus marginata, or jarrah as it is more commonly known, as are the sliding screens shielding west-facing windows and doors from the afternoon sun. Jarrah also finds a home on the interior floors as well as in accents around the cabins. Untreated balau (Shorea laevis) timber was used for the decking component of the project and has been left untreated so as to weather to an attractive natural silvery grey. Stainless steel cable railings complete the deck area without creating any impression of it being closed off from its surrounds. Exposed timber roof trusses lend airy volume to the interior and rafters extending from the inside out contribute a sense of simple continuity to the project that blurs the line between interior and exterior, a feature underpinning the structures’ main purposes of leisure and entertainment. The main lodge includes living and dining rooms, kitchen and bedroom, and is elegantly separated from the cottage with a beautiful deck area that overlooks exquisite westerly views, which on occasion boast gratifying glimpses of Table Bay. Surrounded by vineyards and olive groves resting on ancient soils and breathing deeply of the nearby sea air, the lodge and cottage at Hidden Valley Wine Farm represent a gentle and well-considered nod to their surrounds, not only by means of a light environmental footprint, but an exterior in harmony with its environs.